You are currently browsing the tag archive for the ‘historical’ tag. Source: First Night Design | You’re a Brick, Angela! First Night Design | You’re a Brick, Angela! School stories have always been popular and continue so to be. When I was a child, my contemporaries and I were suckers for Elinor M Brent-Dyer‘s Chalet School series. Some of us went for Enid Blyton; although I read the likes of Malory Towers, I was not enamoured. It was Summer Term at the Chalet School or Mary-Lou of the Chalet School that consumed me. ‘You’re a brick, Angela!’ became a well-known expression symbolising such stories, which were published by Angela (pronounced ‘brazzle’) Brazil and many others. Brazil was one of the first to breach the overwhelming prominence in the marketplace of ‘improving’ books for children. While now we consider her tales quaint, out-dated and clichéd, their influence on other writers was profound. They were devoured at the time although there were some who felt the books were immoral and a bad influence! 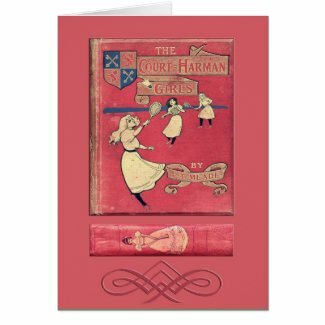 The Court-Harmon Girls by L T Meade, a pseudonym for Elizabeth Thomasina Meade Smith (1844–1914), was published in 1910. The above greeting card is taken from my original copy of the book in which I have incorporated the front cover and the spine, as well as a little decorative flourish!